Malala Yousafzai was shot in the head by the Taliban when she was 14. It might seem a little unusual that we are profiling such a young person, but at just 16, Malala Yousafzai has experienced unimaginable adversity and touched more lives than her age would suggest is possible. Ms. Yousafzai has been an advocate for equal access to education in her home country of Pakistan since she was a little girl, but gained global attention after being targeted by the Taliban in 2012. The Taliban had been inflicting violence on Malala’s hometown in the Swat Valley since early 2004, destroying schools and targeting anyone who disobeyed their orders. Despite the danger that she faced, Ms. Yousafzai continued to attend school and speak out about the power of education, making her a direct target for the Taliban. On October 9th, 2012, members of the Taliban sought to silence the young activist, and shot her in the head during her bus ride to school. The assassination attempt, a terrifying incident that almost ended her life, only strengthened the will of Malala, who continued to focus on activism as soon as she was healed. With support from her father, Malala has continued to courageously speak out for change; her message has now reached all corners of the globe, and despite Taliban threats, she strides on as a symbol of female strength. Using media from multiple nations as a platform, Malala has spoken out about her experiences, and the importance of achieving education through peaceful means. Since her recovery, Mala has penned a memoir, and created The Malala Fund to achieve education for young people in developing nations. She has earned prestigious prizes and awards including Europe’s Sakharov Prize for Freedom of Thought, as well as a nomination for the Nobel Piece Prize. Most importantly, she has spoken out on national television, sat through countless interviews, and shared her story openly, and gracefully, with the entire world watching. 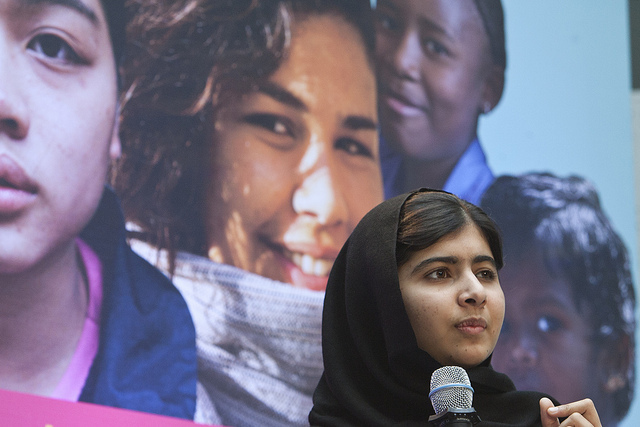 Her message is clear: she will not rest until the right to education for all is realized. In her speech at the United Nations, the poignant young activist said, “The extremists are afraid of books and pens. The power of education frightens them.” Malala knows better than anyone the importance of education; it is a tool to empower young women from all around the world. Ms. Yousafzai is a feminist, activist, and humanitarian whose fearlessness and commitment to achieving equal access to education is inspiring. She is a remarkable leader to a more equal world.